Topics to discuss: What is University level flute playing & what do you learn in University? 1. What level of flute playing is considered "University level?" University level flute performance majors typically play high quality grade 9 and 10 RCM flute repertoire. An example of 'A.R.C.T'(equivalent to grade "11" Royal Conservatory of Music) level is the Frank Martin Ballade which is shown in the above Lorna McGhee masterclass videos. If you are not yet familiar with the repertoire lists typical for grade 9 and 10 Royal Conservatory you may wish to begin to work up to them, learning the technique of the flute, as well as several grade 9 pieces prior to University entrance with the help of your private teacher. Articles for University students at this level of playing are here. College prep. 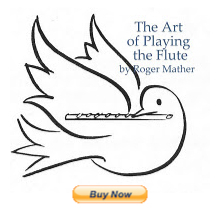 advice for flutists is here. If you are not yet at the grade 9 or 10 level, you will of course want to do daily, very focused practise sessions on tone, technique (scales/arpeggios) and work on the grade 6 to 8 repertoire with your private teacher. Students wishing to become education majors in order to become Band Teachers should be able to play at a grade 8/9 standard on their primary instrument prior to University entrance. Gaubert's Madrigal, Barber's Canzone, the G minor or Eb major (easier) J.S.Bach Sonatas, Ravel Piece en forme de Habanera, Pergolesi G Major Concerto, Tartini Concerto in G Major. If you do not yet have a private flute teacher , (as I often greet several highschool band students each fall who mistakenly have not had private lessons but wish to continue on in University for a music education or music performance degree) you should find a private teacher; information is here. Trying to perform at a high qualityUniversity level with no prior private lessons can create an enormous daily time scheduling problem, as you will need to practise the flute (tone, scales, vibrato, tonguing, dynamics, tuning, etudes, exercises etc.) from 2-4 hours per day while completing a large amount of other musical course work. This can be quite a work load for those who've never studied their instrument privately before, so if you are serious about being successful in your post secondary education, you may need a year or two of prep. prior to commencing a Performance degree. You can always enroll as a part-time University student and take an Arts course, music theory or music history course as well during that prep. time. Part-time jobs that help save for University area also a good idea during prepatory years. The flute student's level of flute playing seen in the video of Lorna McGhee's masterclass at the Portland Flute Festival above, would be A.R.C.T. (or grade "11 RCM"), and would be typical of a recent graduate from a four year Bachelor of Music in Performance. Another complete performance of the entire Martin Ballade is here. This is the level toward which University flutists are working during their four-five years at school. 2. "What is a masterclass?" Flute students arriving at University without previous exposure to flute recitals, competitions and masterclasses may be curious to know "what is a masterclass?" A masterclass features a visiting "master" of the instrument who assists each participant to discover the best musical methods to polish a pre-prepared solo flute work. The student prepares to perform the entire work (with piano), and may be stopped at any point to work on improvements to their playing. The visiting master, such as McGhee in this case with her INCREDIBLE TONE COLOURS, assists the student as much as possible in the time alloted. Usually 4-6 flutists perform in a masterclass each receiving 15-30 minutes of expert help with their prepared pieces. More flute articles to help incoming highschool flute majors are here, on all topics that you'll need to know about before performing at the University level.